Europe 2005: the Constitutional treaty fails; it is decided to launch negotiations with Turkey.Can the Union continue to embody hope beyond its borders and generate despair within them? This is the general picture of the impossible situation as it stands, born of these two simultaneous events. This study, written by committed Europeans of various backgrounds and from several Member States, refuses to consider that relations with EU neighbours will lead either to accession or to nothing at all. It attempts to nurture the concept of a "privileged partnership" which is often spoken of but rarely developed. Since the modification of the French Constitution in an attempt to make the referendum an obligatory step in the ratification of future accession treaties, the question of finding alternative solutions must be raised. 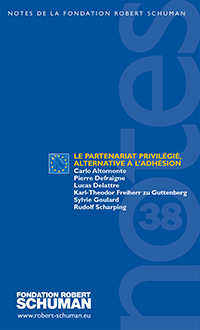 The reason for putting forward a partnership lies in a demanding political vision of the Europe of the future; the privileged partnership is in fact designed even more than ordinary membership, to protect the three fundamental assignments of the European Union which are to guarantee economic growth, stability and the social cohesion of its citizens, to act in the world to defend European views and interests, and finally to contribute to the stabilisation of its neighbourhood. A partnership helps to prevent us thinking that an objective is being pursued in spite of the evidence; it protects the European Union's dynamism more effectively and can boost citizens' confidence. Out of respect for those who would benefit from the partnership the latter must be founded on real goals: it should have the support of institutions and politicians and a co-operation strategy in the domain of foreign policy and defence has to be launched. What institutions do they have in mind for an enlarged Union and by which procedures can they be applied in the wake of the failure of the constitutional treaty? What will the cost of real accession be in order to allow the continued free movement of people and the upkeep of the main common policies? Finally how do they intend to convince European citizens in order to avoid rejection which would be the worst scenario at the end of the day?